Organizations in Jacksonville convene to kick-start a city-wide coalition. 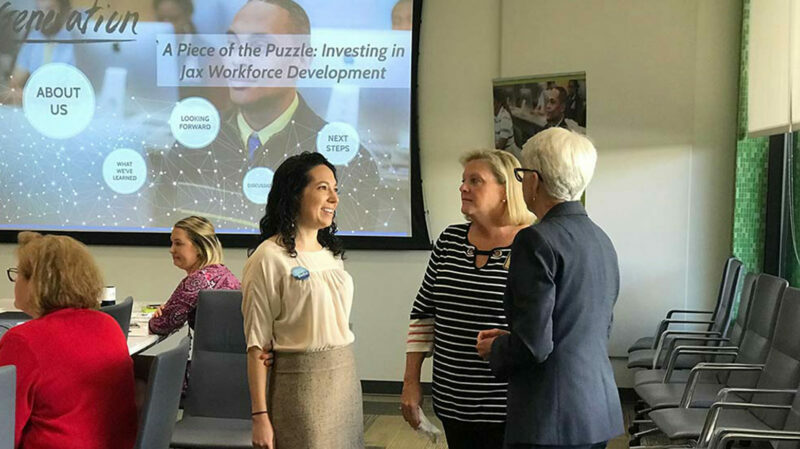 Generation convened a group of Jacksonville city leadership April 5, alongside the Jessie Ball duPont Fund and the Nonprofit Center of Northeast Florida, to tackle one of the area’s biggest issues: the skills gap and workforce development in the region. The unemployment rate continues to decline in the U.S. However, for some disconnected populations, there is an ever-increasing need for organizations to provide assistance. For example, the unemployment rate among African-Americans is nearly double the rate, at 6.9 percent. With various groups in Jacksonville region working on these issues, Generation, the Jessie Ball DuPont Fund, and the Nonprofit Center saw an opportunity to collaborate. Accordingly, organizations such as the Jacksonville Chamber of Commerce, the Jacksonville Public Education Fund, Catholic Charities, Family Foundations, the Children’s Home Society of Florida, Big Brothers Big Sisters of Northeast Florida, United Way of Northeast Florida, and The Salvation Army all convened at the Jessie Ball duPont Center on April 5 to address these issues and learn about a new proposal to coalesce their efforts. “[It was] a great gathering of key partners and helped us understand the good that Generation is having on the market and how to effectively tackle the barriers our community faces,” said Tina Wirth, V.P. workforce development for the Jacksonville Chamber of Commerce. The group discussed Generation’s program, which helps empower individuals to build thriving, sustainable careers, and provide employers the highly skilled, motivated talent they need. Generation presenter and U.S. Retail Program Manager, Alex Rudnick, also proposed an idea for the group to form a coalition, meeting regularly to change local systems and to promote career attainment and advancement for disconnected populations in Jacksonville. The idea proposed is to create and maintain a city coalition of stakeholders, with a wide range of influence, interested in exploring these issues through a place-based change approach, targeting entire communities and aiming to address issues that exist at the city and neighborhood level, such as transportation access, poor housing, access to childcare, social isolation, or fragmented service provision that leads to gaps or duplication of effort, and limited economic opportunities. The group will visit various neighborhoods and organizations in Jacksonville and work to identify and implement solutions. “We want to focus on place-based change, so that means meeting people in the neighborhoods where they live,” said Rudnick. Funded by grants from Walmart and CareerSource Northeast Florida, Generation Jacksonville’s programs focus on empowering youth who have faced significant barriers in their lives, such as students who were previously in foster care, had experience with the juvenile justice system and/or those who are pregnant or parenting. More than 17,000 individuals have graduated from the Generation program worldwide, which prepares individuals for careers in 50 cities and 120-plus locations across 5 countries. In the U.S., 87% of Generation graduates are outperforming their peers and 97% of employers say they would hire Generation graduates again.